Hold Back The Sun (US Asiatic Fleet vs. Japan) by Warren Bell is a military fiction novel that takes place in 1942. This book will appeal most to an audience made up primarily of adults who enjoy military fiction, though some of the more mature young adults who enjoy military fiction would also find it enjoyable. Hold Back The Sun follows Frank Rhea, Jack Sewell, and Captain Garret Laterveer, as well as the women that steal their hearts, Dr. Cinta van Wely, Pamela Mallory, and Catherine van Zweden. Hold Back The Sun follows these brave men and women during the war as their own action impacts on the course of the novel. Hold Back The Sun by Warren Bell was an intriguing read for me as it followed so many different main characters, three men and three women. I really liked the fact that the author gave the women real personalities that made them strong and did not just label them as secondary characters. 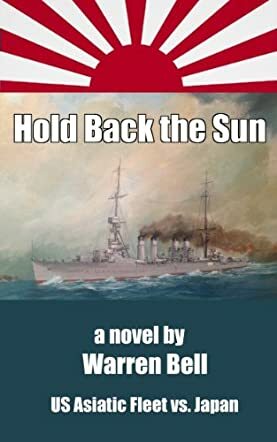 The writing style Warren Bell used in Hold Back The Sun was perfect for this military fiction novel. I found that it truly pulled me into not only the plot line, but also the characters as I began to feel for them as people. I really hope that Warren Bell continues to write military fiction!